1) Who Started the Transporter? The Transporter, often referred to as the NC Transporter, was started in October of 2006 by award-winning film and documentary producer, Richard Sirianni, along with his wife, Susan, a ballet instructor and choreographer. At that time a smoke-free, prearranged airport taxi service did not exist in the Wilmington area and one could barely get a driver to stop smoking in the vehicle, let alone the passengers. Richard (or Rich, or Richie, depending on how long, or how well, you know him) had previously worked in Los Angeles for such notables as Cher, Prince, Madonna, The Jacksons, Barbra Streisand, David Geffen, Johnny Mathis, Elizabeth Taylor and Sidney Poitier. Yes, he still produces a film from time to time. Recently, he was engaged to write a screenplay adaptation and has even written and recorded a full-cast children's audiobook, Percy the Cat and the Big White House, all while running The Transporter. The company is called The Transporter because Susan liked the movie and actor Jason Statham. Mike Oakes started working with Rich in 2004. 2) Are all of your reservations done by prearrangement? Providing service for 3500-4000 annual reservations using 4 vehicles requires that we keep a schedule. That way, the drivers can figure how to schedule their sleep. 3) Do you do early morning pickups and if so, who will my driver be at 4:00AM? The Transporter was actually created because few services wanted to show up for an early morning airport pickup. We create the driver's schedules between 8:00-9:00PM. At that time we will send a text with your driver's name and direct cell phone number for pickups scheduled earlier than 8:00AM, the time that our office opens. We find that this is the best method for contact should you need to reach someone overnight for any reason. 4) How much advance notice is required to schedule a pickup? The usual answer is as much notice as one can provide, especially during the hectic period from March through October. We have many regular business travelers who will provide an entire monthly travel itinerary. If we cannot accommodate you on short notice then we will refer you to one of our backup drivers at another company. 5) Do you travel to Bald Head Island? The Transporter provided just under 3000 transports for Bald Head Island residents and guests between 2014-2017. Many recent Bald Head Island customers have asked if we pickup at other airports in addition to Wilmington, or, can we pickup at other locations besides an airport. Although the majority of our 700+ annual BHI trips involve the Wilmington Airport (ILM), we also have passengers flying in and out of Myrtle Beach (MYR), Jacksonville (OAJ) and Raleigh-Durham (RDU). Passengers frequently arrive on the late, last flight and ask that we retrieve them the following morning from a local hotel and sometimes even a residence. 6) Do you do other type of work besides airport transportation? We have been known for primarily providing prearranged, smoke-free airport transportation for the Greater Wilmington region since our inception but The Transporter also provides medical transportation services. We are all getting older (sorry to remind everyone) and many of you have needed transport to and from doctor appointments, surgical appointments in Wilmington as well as at Duke, Chapel Hill and Rex Hospital in the Raleigh/Durham area, physical therapy sessions, MRIs and the always fun, colonoscopy. For years we have been providing wedding shuttle services, and more recently, we stumbled onto a new revenue stream; transportation for the legal industry. Law firm have asked us to transport a witness to a federal courthouse somewhere in the state, or someone comes to town to testify or give a deposition. Frequently, a law firm will represent a claimant injured in an accident of some kind who will be in need of transportation to various appointments. 7) How far will you travel? The short, simple response---How high is your credit limit? A slightly longer answer---The Transporter has longtime customers who travel to Savannah, Charleston, Asheville, Washington D.C., Richmond and Pennsylvania. 8) Are the vehicles commercially insured and do the drivers have the proper permitting? Our vehicles adhere to the state-mandated, commercial liability coverage limits and the drivers have the proper permitting from the City of Wilmington, the Wilmington Airport, or both. Please know that a number of local services are attempting to operate with personal tags and insurance in order to circumvent our ever-increasing, commercial liability premiums. The Transporter does not expect to get every trip, but if you have friends and family using other services, please ask if the service is properly licensed and commercially insured. 9) Do you have any female drivers? We have had 3 female drivers in the past and at this time we do not have any. 10) How many passengers can you accommodate in your vehicles? 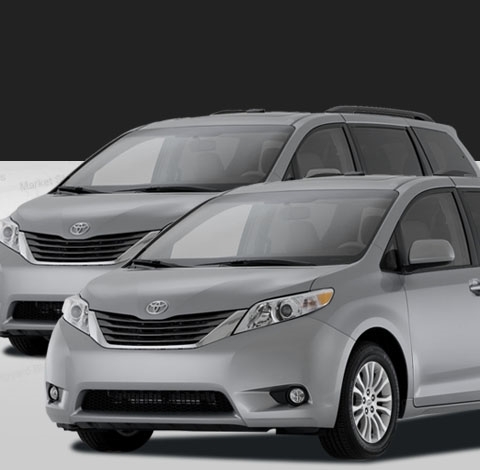 Each of our 4 Toyota Sienna minivans accommodate up to 7 passengers and luggage. Multiple golf bags sometimes alter the luggage configuration and it would be customary for a larger group with luggage and items such as a stroller or playpen to reserve two vehicles. 11) Do you have child seats? North Carolina state law requires that children under the age of 7 or under 70 pounds be transported in a child seat of some type. We have front-facing/rear-facing combo seats, infant seats, boosters and high-back boosters. We will provide the seats without any additional charge. Please let us know not only the age of the child but more importantly, the weigh. 12) What if my flight is late? The drivers track the flights. If your flight is late this usually will not be an issue. Should the delayed flight result in a schedule conflict then we will bring in a backup driver from another company to transport you to your destination. We ask that you let us know as soon as possible if you have missed a connection. 13) Are rates per trip or per person and does it include the tip? Rates are always per trip and not per person. The fare includes everything but driver gratuity. The Transporter is both a City of Wilmington and Wilmington Airport-permitted service. As such, we use the regulated taximeter rate of $3.00 plus $2.10/mile for local trips. We also use this rate as a starting point for calculating out-of-town rates. 14) Do you charge for extra stops? We allow for a quick, 10 minute stop en route to the destination without charge. Sometimes, for example, passengers heading to their week-long Bald Head Island vacation may wish to make multiple stops. For shopping sprees longer than 10 minutes we charge anywhere from $10.00-$12.50 per half-hour wait time. 15) Do I need to provide a credit card in order to hold a reservation? No. We try not to extract the money from you right away and a credit card is not required. You may pay the driver directly by cash, credit card or check upon arriving at your destination. Having said that, many customers actually prefer to prepay by credit card for themselves or others. We will accept credit card information by phone. Corporate and frequent travelers often ask that we keep their card on file with an emailed receipt after each trip. 16) Do you have a secure portal for online payments? We have not yet come to trust the transmission of sensitive information via the Internet. Possibly someday we will learn to embrace online payments but with all the fraud and theft in the world we simply prefer to accept credit card information by phone. 17) Do you allow pets? We do have customers who travel with their pets. Most are of a smaller breed (the pet, not the customer) and sit in the lap of its owner. If you have larger pets that shed we will likely ask that a carrier be used since drivers may not have time to vacuum the vehicle prior to their next pickup. 18) May I smoke in your vehicle? No. Our vehicles are smoke-free and so are our drivers. While we're on the subject, this also goes for alcohol consumption. 19) Do you have any sedans, limos or SUVs? We presently operate 4 Toyota Sienna minivans. We are not a limo service with partitioned vehicles. 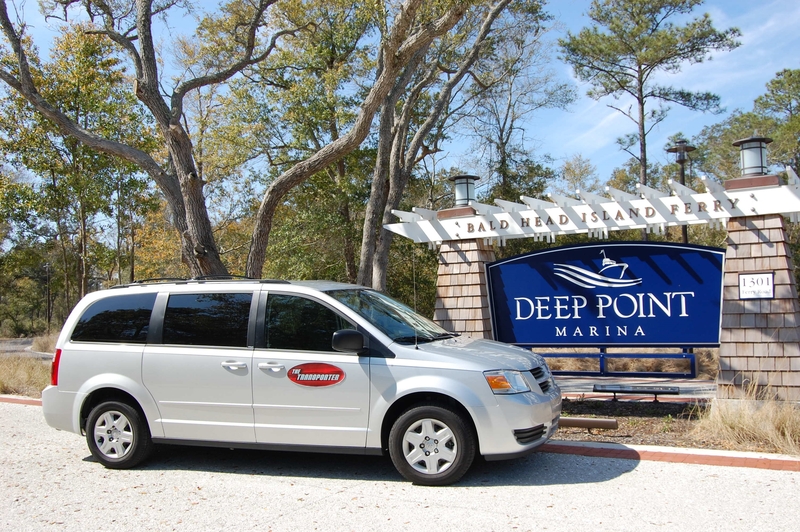 The sedans were removed from our fleet a few years back when families traveling to resort destinations such as Bald Head Island, Holden Beach, Ocean Isle Beach and Topsail Island were growing fast and bringing plenty of luggage. We found that most SUVs could not accommodate these families and the Toyota Sienna minivan was the optimal choice for long-haul situations. 20) What made you join the Better Business Bureau? First of all, The Transporter has always had an unaccredited A+ rating with the bureau. The BBB called in 2017 asking that we join when they became aware of what we already knew; the Greater Wilmington area lacks an abundance of quality transportation services, and legitimate ones at that. Many listings on Google are for services either long gone, or do not possess a proper business license to operate in the City of Wilmington. Many customers tell us they reserved with The Transporter because of the abundance of positives reviews (we could always use more, if you have a minute) and our BBB status. 21) Does Uber operate at the Wilmington Airport? Uber pays the Wilmington Airport an annual fee for privilege of allowing a maximum of ten vehicles to simultaneously occupy a section of the cell phone lot. Please know that Wilmington Airport-permitted services such as The Transporter pay the airport $200.00 per permitted vehicle each quarter. Permitted vehicles must pass quarterly vehicle safety inspections and drivers must submit to annual background checks and drug testing, even random testing. Uber entered the Wilmington market on the state level, over-riding city and county regulations, and their vehicles and drivers are not subject to the above-mentioned safety requirements. 22) Where's Shane, and whatever happened to Bill and old Roger? Contrary to popular belief, Richard did not work anyone to death. Bill Tiernan, who assisted us in building our Bald Head Island business, passed away very suddenly about 7 years ago as did Roger Bouldin, who was, well, old. Very old. Shane left us in 2017 after 5 years of service to try his hand at other ventures. We hear, though, that he may have an interest in returning, at least part-time, and we will know more as the year progresses.